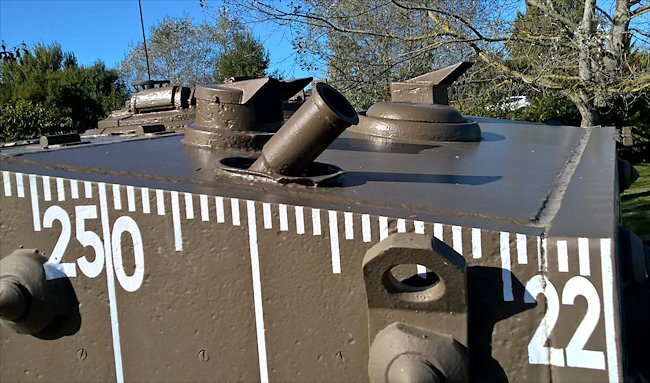 This restored WW2 D-Day Royal Marines Close Support Centaur Mark IV tank used to sit opposite the Pegasus Bridge Cafe next to the canal and the bridge but it has now been moved to the grounds of the Pegasus Bridge Memorial Museum on the other side of the canal along with the original bridge. It has been replaced by a Bofars Anti-Aircraft gun. 'Vidette' is one of the few Centaur Mk IV close support tanks to survive the war. The D-Day objective Pegasus Bridge and the Musee Memorial Pegasus Museum can be found in the town of Benouville. The address of the Pegasus Bridge Memorial Museum is Avenue du Major Howard. If your Sat-Nav device does not find the road in the town of Benouville then use the town of Ranville instead as it is on the border between the two. If you want to go to the Pegasus Bridge first then entre the town of Benouville into your Sat-Nav and then type the road name Place du Commandant Kieffer. Have a snack at the Cafe. Prices are a bit more expensive than normal but the historical view is worth it. Take time to look around the inside of the Pegasus Cafe. There is a lot to see and study. 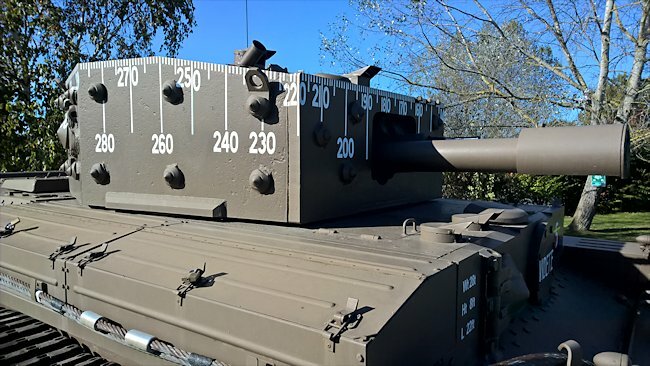 The Centaur Tank was fitted with a High Explosive HE round firing 95mm Artillery Howitzer rather than the Normal British Ordnance QF 75mm anti tank gun fitted to the Cromwell Tank. The Centaur was designed to provide close support to the Royal Marines landing on the French coast of Normandy on D-Day 6th June 1944. The gun was intended to be fired from the landing craft at enemy fortifications on the beach. The Centaur chassis was the same used for the Cromwell tank but the Centaur had much less efficient engine. A Rolls-Royce Meteor V12 petrol engine powered the Cromwell tank. It was a tank version of the Spitfire's Merlin engine. The problem was that they were in short supply so a Nuffield Liberty engine was fitted and these tanks were called the Centaur. It was under powered. It had a maximum road speed of between 22-27 mph and a cross country speed of only 12.5 mph. Its armour thickness ranged from 20-76mm. This Mark IV Centaur was built by Leyland. 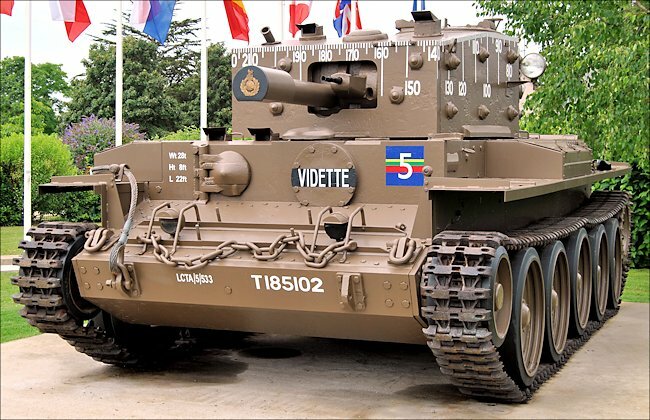 It was part of V Troop of the 5th Independent Battery of the RMASG and it landed on D-Day at Sword Beach between Hermanville-la-Breche and Lion-sur-Mer. It came into contact with the enemy some five hundred yards from the beach. It reversed up to a hedge but was hit by mortar fire that set the bins and then the engine compartment on fire. The crew evacuated, and the vehicle was left behind as the fighting moved on. Sixty Five Centaur tanks were built as close support vehicles with the 95mm howitzer gun. They were crewed by the Royal Marines Armoured Support Group and saw action on D-Day, giving covering fire from their landing craft, and afterwards. The RMASG was composed of two regiments, the 1st attached to the British 50th Division and the 2nd to the 3rd Canadian Division, and one Independent Battery under the British 3rd Division. It was equipped with twenty Shermans and eighty Centaur Mark IV close support tanks. Within fifteen minutes of H-Hour, twenty Centaurs were ashore and eight more followed within four hours. They were intended only to operate during the initial assault and then within one mile of the beach, since they did not have an administrative and maintenance organisation, but eventually stayed in action for fifteen days and as much as ten miles inland. Originally the plan was for Centaur 95 mm howitzer tanks to be lashed down to landing craft but raised up on a false floor. These flat bottomed landing craft armed with tank turrets would be able to get close to the beach and provide the attacking Allied troops with covering fire. The tank's engine was to be removed and the vacated space used for ammunition stowage. The turret markings allowed the battery commander outside the tanks to direct all the tank howitzers to the correct location on the beach. It was not dissimilar to the range clocks on WW1 battleships. In the event it was decided that the raised loading position on the false floor was adversely effecting the trim of the landing crafts. It was making the landing craft top heavy and liable to capsizing. Several accidents happened hence the Centaur wrecks off the south coast, so raised decks abandoned. Engines were re-instated and vehicles drove ashore after only a limited amount of shots from the well of the landing craft. The Battery Commander's vehicle were 75mm Sherman tanks. They also had the 360 degree markings on the turret. Although D-Day was probably the high point of the Centaur story, some Centaurs were used for training or were converted for special purpose roles such as dozer tanks. Others were re-engined with Meteors and fought as Cromwells. 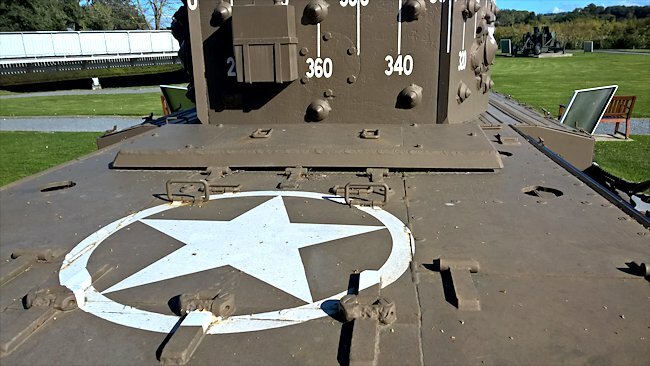 All Allied tanks used on D-Day had this star insignia painted on them to help in identification. It was recovered in 1975 from Hermanville by 7 Field Workshop, REME, based in Fallingbostel. It was then restored by 60 Station Workshop, REME, in Antwerp and put on display in June 1977. Most of the Centaur’s roadwheels, as well as some other parts, are not original. It was reported that there were plans for it to be moved to the Caen Museum (q.v.) but these didn’t come to fruition. In recent years the Centaur was moved a short distance and is now opposite the famous Cafe Gondree beside the road that crosses over Pegasus Bridge. Its paint was peeling and its condition has generally deteriorated. 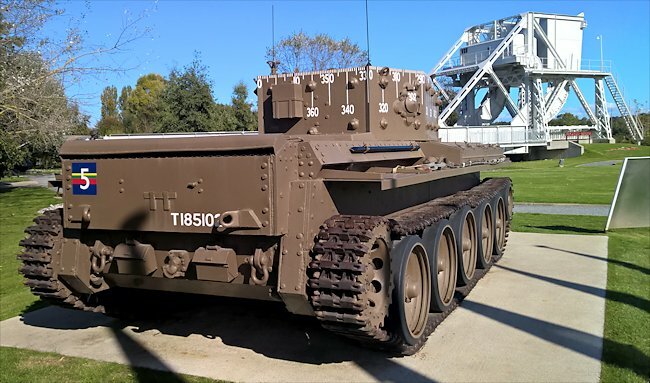 With the opening of the new Pegasus Bridge Memorial Museum the tank underwent a full restoration in 2014 and found a new home in the grounds of the Museum. The markings on the turret were used by the artillery observer outside the tank in the landing craft to tell the gunner what angle to point his gun. The British Public Records Office has in its index a publication entitled Camouflage Training 1944-53. These instructions were the ones which replaced those withdrawn in early 1944, and we know what the new camouflage colours and system were, both from photographic evidence and from people's experience in the army during the 1944-53 period. In these 1944 instructions, the basic overall colour was changed to khaki drab, which was very similar to the pre-1943 colour, but with more of a brown tone instead of a yellow one. The paint would either be SCC No.2 (Khaki Brown) or SCC No 15 (Khaki Green). So we have for D-Day some vehicles in this new khaki drab, others in dark earth, possibly a few remaining in the pre-1943 olive green, plus the U.S.A. and Canadian vehicles in olive drab. All these basic colours were subject to variations caused by application, dilution, exposure to wear and tear and the elements, as described in the previous section on the U.S. Army. New vehicles were sprayed with these overall colours at the factories, older vehicles being repainted in the current colour by the crews or Services as repainting became necessary. Early in 1944, the camouflage patterns were also changed to the system which has now become known as 'Mickey Mouse Ears'. This consisted of large areas of matt black, looking rather like cumulus cloud and formed by painting a number of inter-joined circles of varying diameters. Again, the black paint was applied to all top surfaces, with extensions down onto the vehicle sides, and along the bottom edges of the vehicle. Some vehicles also had individual areas on their sides, formed from three or four interlinked circles. In the 1944 pattern, the underside of the chassis was also painted black. This black paint was quick drying, and was applied freehand with a brush at an army depot, either by soldiers or by civilian employees. The older patterns will have been replaced by the crews as re-painting became necessary. Where dark earth remained the overall colour, or where the black paint was applied over khaki drab in only one coat, the black sometimes took on a dark brownish tinge. U.S. and Canadian vehicles were issued to British troops in olive drab, and in most cases this overall colour seems to have been retained until either the vehicle needed repainting or it went for repair or modification, when khaki drab was applied. Some amphibious and wading vehicles were painted in Admiralty light grey for the D-Day landings.